This winery was founded by three friends from the Midwest and East Coast who shared a passion for wine. 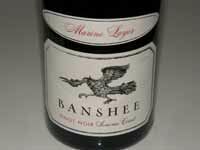 Their paths converged in San Francisco and in 2009 they pooled their money to make the first vintage of Banshee Wines Pinot Noir which sold out in three months. This winery focuses on Pinot Noir from the Sonoma Coast and West Sonoma County. In 2012, Ross Cobb (Cobb Wines, Hirsch Vineyards) and Katy Wilson (LaRue) were brought on as consulting winemakers. The wines have become quite popular and are sold through the website. A value-priced label, Rickshaw, is a California blend aged in stainless steel and oak ($15).